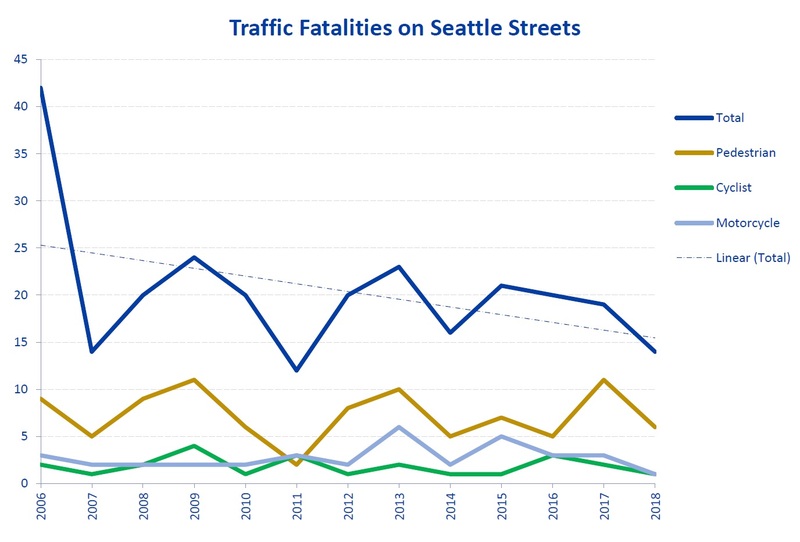 SDOT's Vision Zero update: no recent progress, but hope for the future. 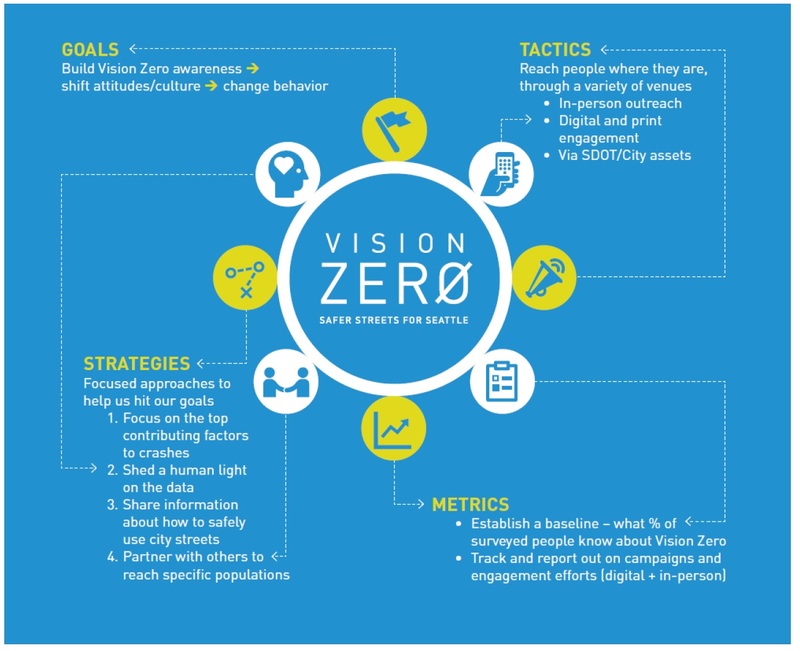 SDOT’s Vision Zero update: no recent progress, but hope for the future. 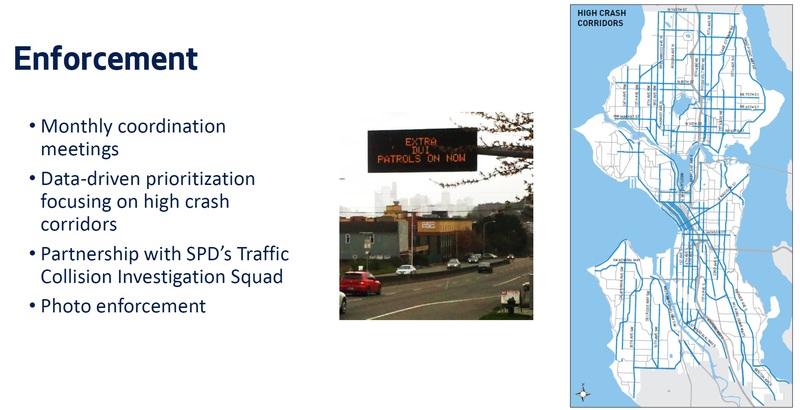 This afternoon, SDOT gave the City Council an update on the city’s “Vision Zero” initiative to achieve zero annual traffic fatalities. The bad news is that there has been little progress in the last several years. The good news is that SDOT has some new ideas for how to change that. 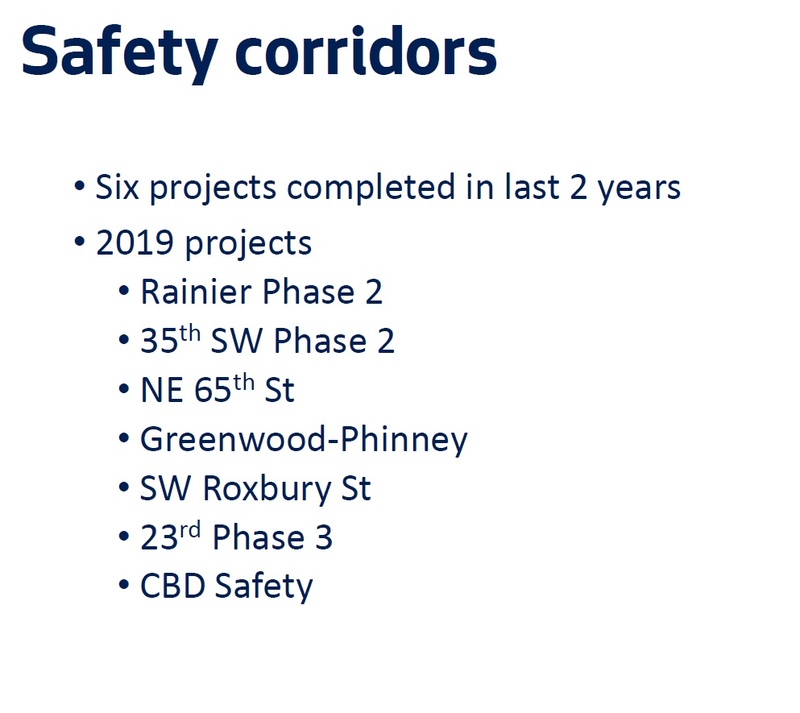 SDOT’s Jim Curtin summarized these slides by saying “We’re making progress.” Which is a lie. We can assume the data is accurate; the untruth is in the linear trend lines superimposed on top of the charts. There clearly is no linear trend in either graph: in the top one, it’s been flat since 2011, and in the bottom one it’s been flat since 2007. Local transportation activist Ryan Packer pointed this out in the public comment session before today’s hearing (I did the same on Twitter over the weekend). Council member O’Brien, the transportation committee chair, echoed that sentiment, though he stopped short of calling it a lie. He did express his own and others’ frustration that the city isn’t making progress and his own powerlessness to do anything about it, while recognizing that SDOT didn’t have a permanent director for over a year (until last week when Sam Zimbabwe was confirmed), and that some good planning has happened. 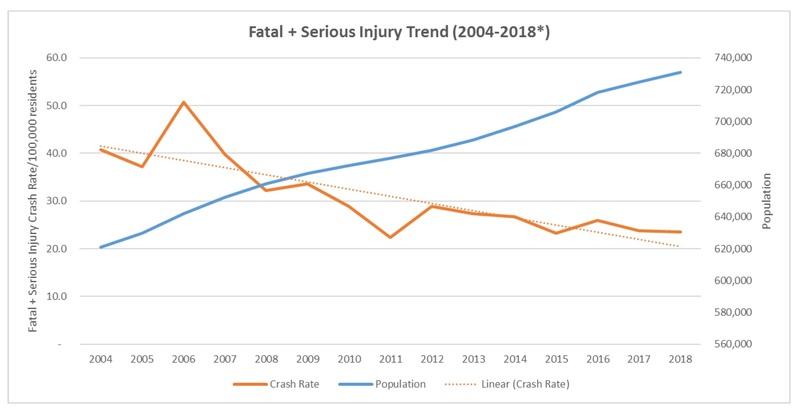 More encouraging was SDOT’s discussion of what it knows about the underlying causes of serious and fatal incidents in Seattle, which suggest ways to focus the effort to reduce them. It knows that pedestrians, bicyclists, motorcyclists and older residents are disproportionately represented in the incidents — partly because vehicles continue to add safety equipment to protect the driver and passengers, but not people outside the vehicle. They know that the most common contributing factors are impairment, distraction (including devices), speeding, and failure to yield to pedestrians. And they know that 90% of all serious and fatal crashes happen on arterial streets. Below is a map of the incidents that occurred from 2016 to 2018; it’s easy to pick out the arterial streets. Safety improvements along particularly dangerous corridors. While they have only completed six such projects in the last two years, they have eight planned for this year. 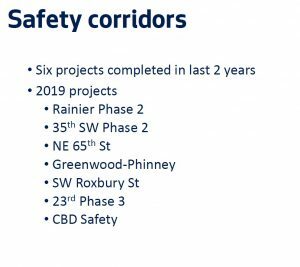 Top of the list is the infamous and much-overdue Rainier corridor, which Curtin says has been a “technically challenging” project, but they plan to start work shortly. 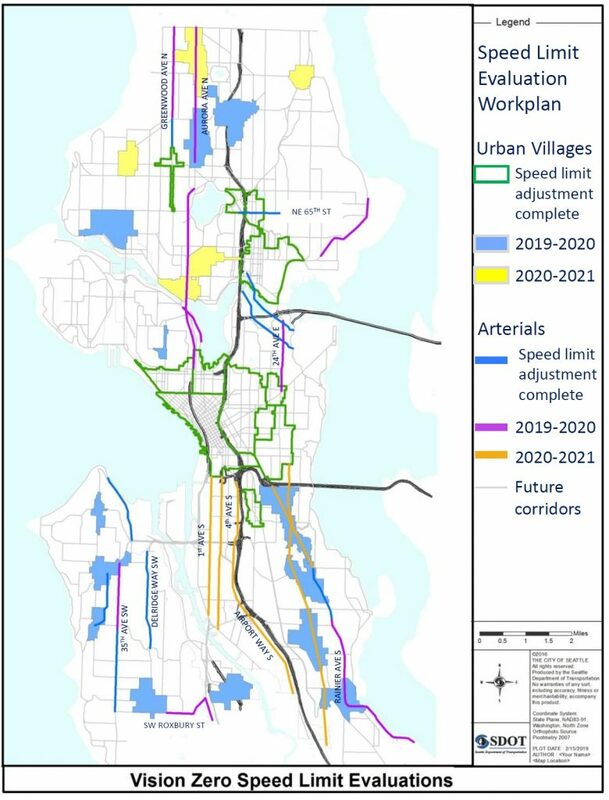 That will include reducing speed limits on every arterial street in the Rainier Beach urban village. They aim to finish the Rainier project before school starts on September 1st. Reducing speed limits. This has been a multi-year effort: with the support of the City Council, speed limits were reduced to 20 MPH on all non-arterial streets in 2016. Speed limits were also reduced on nearly 200 miles of the city’s arterials over the last two years, mainly focused on those in urban villages. Now they are looking harder at arterial sections outside of urban villages, especially along major bus lines. Leading Pedestrian Intervals. This is a change to traffic light timing, so that pedestrian “walk” signals change 3-7 seconds before the traffic lights change in the same direction, allowing pedestrians to get into the crosswalk and be seen before cars start moving. 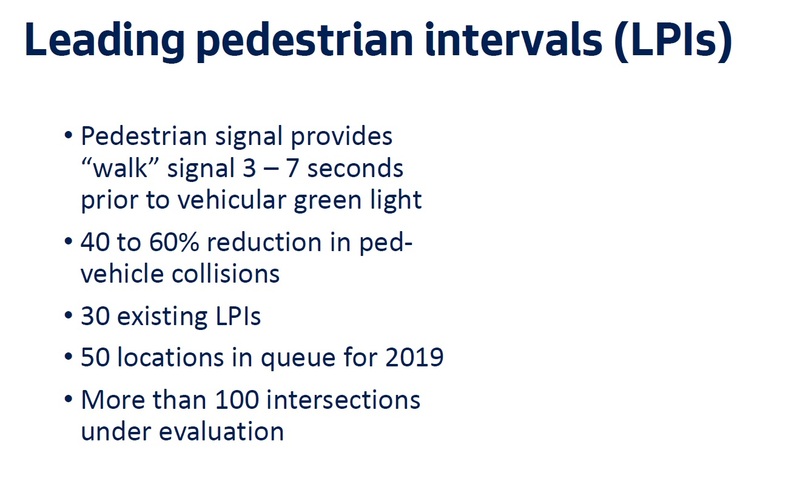 New York City has installed LPIs in nearly 2000 intersections, and in places where it’s been installed it typically reduces pedestrian crashes by 40%. 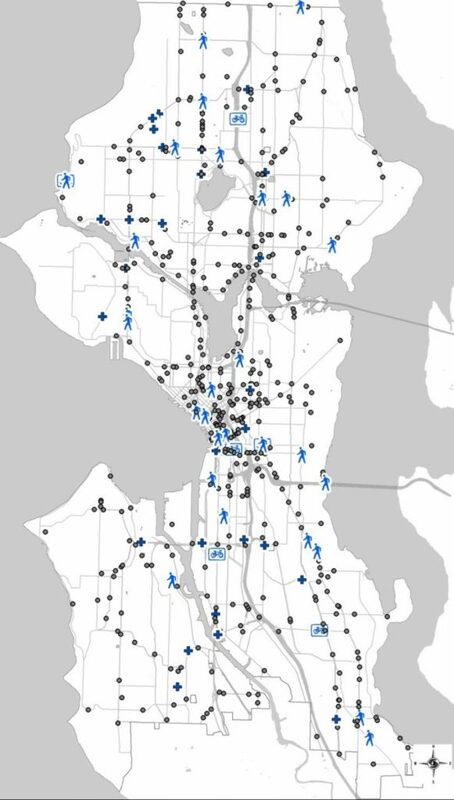 SDOT has already installed 43 (prioritizing high-crash locations), and has a list of over 100 more intersections where it plans to install them. 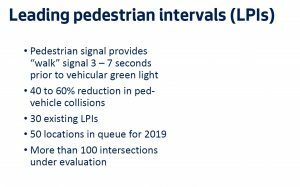 This is a “big bet” for SDOT that it is very excited about; it has received a grant from WSDOT to eventually install LPIs throughout the city. Enforcement. SDOT has been investing in improving its partnership with SPD, both in terms of data-sharing to better identify problem areas, but also on planning enforcement activities in high-priority areas. SDOT is also looking at red-light cameras; their data says that the cameras already in use have reduced collisions at those intersections by 25%. Education. SDOT has been working on trying to reach people “where they are,” through in-person outreach, partnering with community-based organizations, and digital and print engagement. They are also increasing their market research to better understand perceptions of traffic safety in Seattle. An update to its 2016 “Bicycle and Pedestrian Safety Analysis” study, with three additional years of data, protected bike lanes included, and a new exposure model. Version 2.0 of the “Seattle’s Safest Driver” competition, where Seattle drivers use a mobile phone app to measure the quality of their driving. SDOT promises it will run the competition again this spring — with bigger prizes. Partnering with SPD on pedestrian safety “emphasis” patrols, in which a plainclothes police officer will cross a street at an intersection or crosswalk, and another officer down the street will be stationed to pull over vehicles that fail to yield to the crossing officer. SDOT and SPD will inform the community and the local media before they begin the patrols. This will be a 3-year program, beginning this summer. While it’s disheartening to see the lack of progress over the last few years, it’s good to see that SDOT is implementing projects that have proven track records of producing results in other jurisdictions, and is trying to collect data that will help it to make better decisions on future projects. Both Council members O’Brien and Johnson held out hope that technology could play a part in Vision Zero as well, such as reducing distracted driving by being able to detect when the owner of a device is driving (versus riding as a passenger). Interestingly, O’Brien argued that as a means to reduce impaired driving, all cars should be required to have Breathalyzers installed that must be used to start the vehicle — and not just the cars of repeat DUI offenders.